Jewish tradition tells us that Joseph, Moses and King David all died on Shabbat. Thus, it should be no surprise that the modern day prophet Elie Wiesel passed away on Shabbat as well. Wiesel, an educator, writer, humanitarian and visionary, died on Shabbat, July 2, 2016. He was the voice of the survivors of the Holocaust, as well as the voice for those who perished in the Shoah. 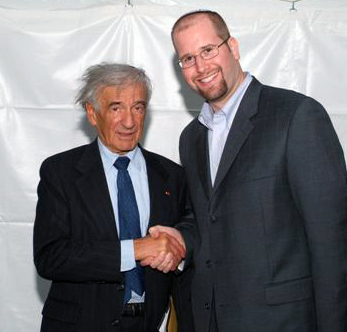 Like so many, I was fortunate to have the honor of meeting Elie Wiesel and hearing his words of wisdom on several occasions. He was an inspiration to millions around the globe. His books occupy a section of their own in my library because they seem to be their own genre. Wiesel was a leader, but more important he was a voice of reason in our fragile, broken world. Rather than trying to write a blog post to honor Wiesel, which feels impossible with everything he accomplished in his life and all of the deserving accolades he received, I'd rather share his own words below. What follows is Elie Wiesel's speech upon receiving the Nobel Peace Price in 1996.